In one of my previous posts, I had mentioned about a short story anthology, titled Love and other enchantments which has been sailing, albeit along crests and troughs, for a few months now. Two days back we received the design of our book’s front cover.The publishers had asked us if we had any particular suggestion regarding the diagrammatic representation of our collection, and we had conveyed the theme that was brewing in our minds. The theme was solely love and its essence, although a bit skewed towards the poignant nature of it, more than the picture of mushiness that most people tend to associate love stories with. 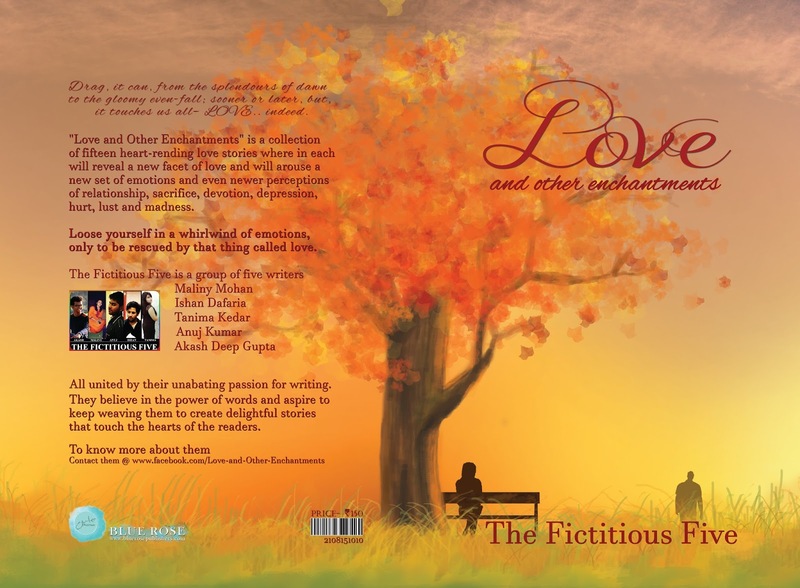 And this is owing to the fact that each story in the anthology is soulful, portraying the sheer intensity of the varied shades of love, rather than focussing merely on the exhilarating nature of it. I would like to thank the publishers- Blue Rose Publishers for being thoughtful enough to listen to us and for having come up with a cover design, which exudes evocativeness as much as subtleness. And it should not be left unsaid the sturdiness of our group – The Fictitious Five, members of which being along with me, Akash Deep, Anuj Kumar, Ishan dafaria and Tanima Kedar, because of which, despite having had conflicting ideas at times, we could dissect each one’s opinion to reach a fitting conclusion. Having let out a few nuggets about my new venture, I would also like to add that, our dream ship is now on its final lap, gearing for release, which should happen in a couple of weeks.